We shouldn’t need the terrible luck of an inheritance in order to give our children the beginning we want. When I had my daughter in January 2014, my father—always the first to grab his checkbook when I needed rent money, or a non-thrift store winter coat, or a load of groceries—gave my burgeoning family the gift of nearly eight months’ paid maternity leave. How did he do this? He died. In November 2012, five months before I became pregnant, my father suffered a fatal heart attack, and left behind a complicated estate for my husband and me to sort out: a three-family home in an economically-depressed area of upstate New York, a sizable combined medical, mortgage, and credit card debt, and a fully operational, turnkey business—a sports bar called Close Quarters, which my dad owned for over 15 years. It was this last piece of his estate that made all the difference. Because Close Quarters was incorporated, legally a separate entity, the small profit we made from its sale did not have go to paying off my dad’s debts. Instead, we put the money in the bank, and when my daughter was born six months later, I took a semester off from teaching at a branch campus of the University of Wisconsin. I spent that spring and summer in Eau Claire with my newborn daughter, making my best effort at following the stringent recommendations of the American Academy of Pediatrics: breastfeeding on demand (my daughter demanded every 45 minutes or so), doing tummy time, reading board books, and (not) sleeping in the same room with my (not sleeping) baby. In September, when Benna was 7.5 months old, I returned to teaching, this time at a university in Boston. The money from selling Close Quarters also paid for the majority of our moving costs. Wisconsin Representative Paul Ryan, whose political track record includes a number of budget proposals with spending cuts that negatively affect poor and working-class families, has said he will only run for the newly-vacant Speaker of the House position if his weekends at home with his wife and three children are not disrupted by the duties of the job. A bitter laugh rises in my throat as I remember the options I had as a visiting assistant professor in Ryan’s home state. Because I was hired in Wisconsin at five weeks’ pregnant, and because, before that, I had eked out a living as an adjunct professor without benefits, I did not qualify for the 12 weeks of unpaid leave guaranteed by the Family and Medical Leave Act. Though my department chair—a fierce advocate for her faculty, and a mother of three—was generously willing to hire me and hold my position if I took a semester off after giving birth to my daughter, my husband and I would have not been able to afford it had we not sold my father’s bar. The only other option would have been taking my three weeks’ of accrued paid sick leave, and then returning to the classroom when my daughter was less than a month old. But because my dad died, I didn’t have to do that. During the recent Democratic debate, frontrunner party candidates Hillary Clinton and Bernie Sanders both outlined the need for paid maternity leave in America. Martin O’Malley, too, supports paid maternity leave. This is a welcome and long overdue show of powerful hands, and it heartens me to think that, should the general election go the Dems’ way, I could entertain the possibility of a second child. I’d need paid leave the second time around. I don’t have another business I can sell. Before Quebec implemented a “daddy quota” in its paid leave policy, where five weeks of the leave a family is given can only be taken by fathers, household duties were mostly taken care of by women. After the quota went into effect, though, fathers significantly increased how much time they spent on unpaid household work and mothers spent more time in paid employment, even seeing an increase in their incomes. In Sweden, mothers’ incomes rise 7 percent for every month of leave their husbands take. Other cross-country studies have found that in countries with generous paternity leave benefits that fathers actually take, the men end up doing much more child care. Secondly, it’s time to admit that 12 weeks is simply too little time to genuinely address the physical, emotional, and financial implications of having a child. 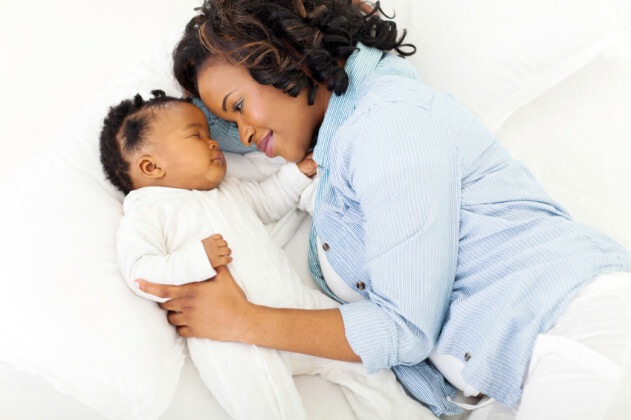 Most 3-month-old babies are not sleeping through the night, and therefore, neither are their parents. A mother’s birth injuries may still be causing pain or discomfort—after my emergency c-section, I relied heavily on my husband to carry laundry baskets up and down our basement stairs, and a shoulder injury I received in labor meant I could barely pick up my baby without an extra set of hands nearby. Twelve weeks is also a fraction of the 52+ weeks the American Academy of Pediatrics recommends for breastfeeding an infant. I am 100% in favor of a mother’s right to choose whether or not she breastfeeds, but the choice is too often made for a mother by her early return to work. Some mothers, like me, can’t produce enough milk using a breast pump, or do not have adequate time and space at their place of employment to pump. My own return to work necessitated the introduction of formula to supplement the breast milk I wasn’t able to pump. Formula was an expensive addition to our regular spending. And speaking of additional costs: Sending a 3-month-old baby to daycare places another economic burden on families. With the cost of childcare rising to account for 7-25% of a family’s annual income, those additional months of daycare can run a growing family thousands of extra dollars. The money saved from keeping an infant home for another six months to a year would be considerable, especially if the family is paying off medical debt from their child’s birth. Now that the conversation about paid parental leave has been taken up by both Democrats and Republicans, American families have an opportunity to say what we really need. And what we need is more. We shouldn’t have to be in positions of power, like Paul Ryan, in order to demand that the rhetoric of “families first” be applied to us. We shouldn’t need the terrible luck of an inheritance in order to give our children the beginning we want. It was at Close Quarters that I told my father—less than two months away from his heart attack, though none of us knew it yet—that my husband and I were soon to start trying to get pregnant. My dad was already not feeling well, but had chalked up his recent weight loss and fatigue to stress. Though he was one of America’s prized small business owners, who had a reputation for paying his bills the day they arrived, employed community members with criminal records, and was a beloved and loyal friend to all who knew him, my dad was scared, drowning in debt from the cost of his health insurance and a mortgage irresponsibly sold to him in the late 1990s. He wasn’t sleeping well at night, kept awake by anxiety and dread. At 63 years old, he was sure he’d never be able to retire.